Approximately 12/5/8 inches / 32 cm wide. 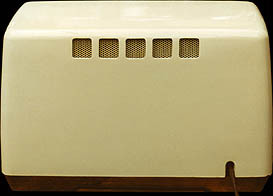 Ivory painted Bakelite cabinet. Tube complement: 12BA6 RF amplifier, 12BE6 mixer/oscillator, 12BA6 IF amplifier, 12AT6 detector, 35C5 AF output, 35W4 rectifier. 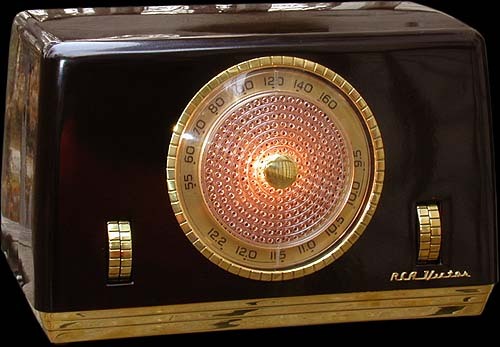 I've found that most RCA sets have above-average, better-performing, circuit designs that cost more to produce (because they use more parts). 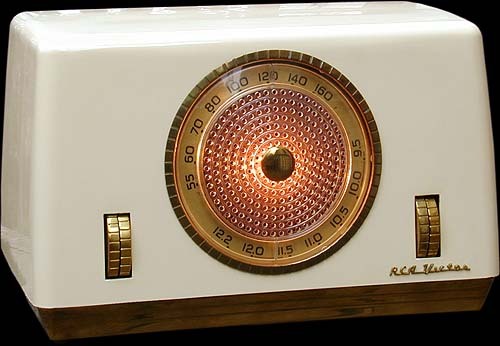 This RCA Victor radio is no exception. 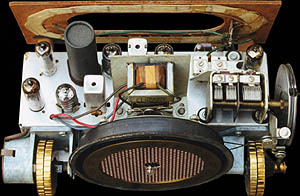 Among its many deluxe circuit features are: RF stage (with tuned output and three-gang condenser, no less) for higher sensitivity; tone control; two bands (AM and shortwave); padder condensers for accurate tracking at the low end of the bands (not only a padder condenser for the low end of the AM band, but one for the shortwave band as well; and, if that were not enough, padder condensers for the amplifier tuning on both bands in addition to oscillator tracking. Wow!). The back of the '682. Look at this smooth rounded shape . . . . . . covering this deluxe chassis. Unpainted, dark brown Bakelite cabinet.